It is early in the morning and I wake up to the sound of dogs barking. As I struggle to free myself from a mosquito net, I realize that I am not in my room. As I slowly walk out of bed, I find myself surrounded by people I barely know, speaking a language that I can barely understand. I feel a chill outside. I am not in the blazing hot sun, but in the cold chilly winter in the middle of July. I am far from the familiarity of Dublin, California, all the way across the globe in the nation of Paraguay. Around March, I started researching extracurricular programs in preparation for my summer. As a result, I was able to find two different programs: one in Korea and one in Paraguay. I applied to both those programs and I was fortunate enough to be accepted into both of them. However, I was faced with a dilemma as I had to choose between the two places. It was really difficult to choose between the two, but after thinking about it deeply, I decided upon Paraguay. Paraguay had a very unique charm to me. I had already been to Korea many times and figured that it would not be a new experience for me. I wanted to visit new places and learn of a new culture (of course while improving my Spanish). Now you may wonder, what was the program and what did I do in Paraguay? The program I got accepted into was one called Youth Ambassador of Amigos. It is a multi-cultural experience program sponsored by the U.S. Department of State. 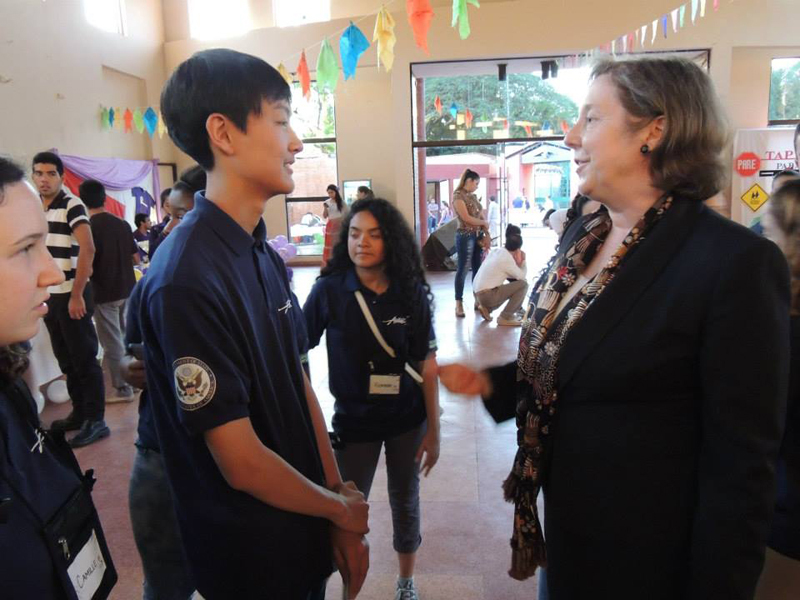 Every year, the Department of State selects 400 high school students like me from around the country and sends them to 25 different countries around the world, Paraguay being among them. The total length of the program last more than six months and is all expenses paid, including three full weeks of abroad travel. I was able to experience cultural exchange and go through leadership development. 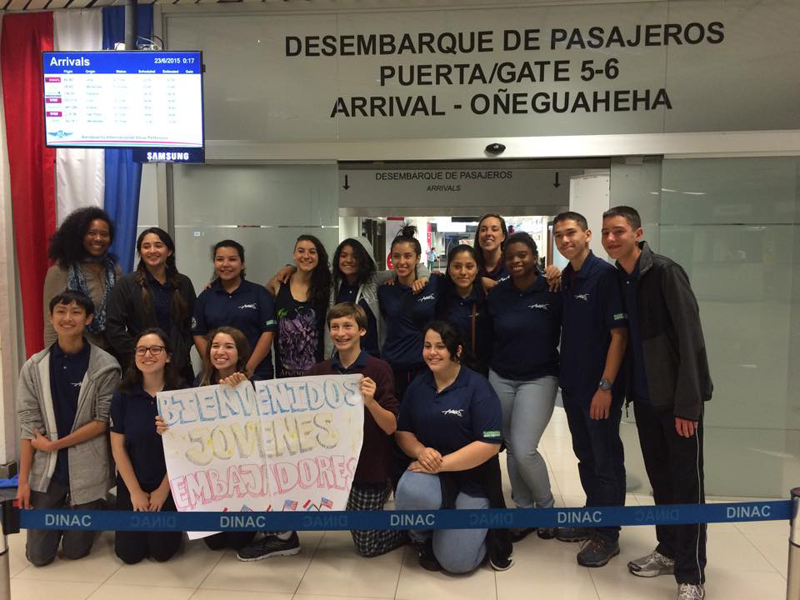 Youth Ambassadors allowed participants to go through a two-way cultural exchange for high school students across the world, and America, to receive leadership training. For three weeks I went abroad with 12 other candidates and two mentors and embarked on my journey onto Paraguay. The first few days were almost unreal because I did not get the feeling that I was in Paraguay. In order to get accustomed to the culture and time difference, we resided in a hotel called Hotel Chaco for a couple of days. While there, we got to meet the Youth Ambassadors from Paraguay who visited the U.S in 2014. They told us all about their experiences when they went to America. Although we had a lot of trouble communicating, it was fun and I slowly began to get used to the lifestyle in Paraguay. After residing in the hotel, all the participants got to attend a festival while we waited for our host families to pick us up. I can still vividly remember the deep nervousness I felt while waiting for my host family members. Before going to Paraguay, I had gotten information on who my host family was, but with meeting them in person came a newfound anxiety. When I first met my host family, it was a very strange feeling: I felt happy, yet also scared because I was afraid that I could not communicate with them. However, my host family members were extremely kind and considerate towards me, allowing me to be relieved of some of that stress. My host family was outgoing, playful and enjoyed playing a lot of jokes. My host father Jorge loved to play jokes on me and often made fun of me for sleeping in too late. My host mom Lorena loved her café and we would often chat whenever we had the chance. My host brother Nico was very welcoming and invited me to hang out with him, whenever we had the chance. 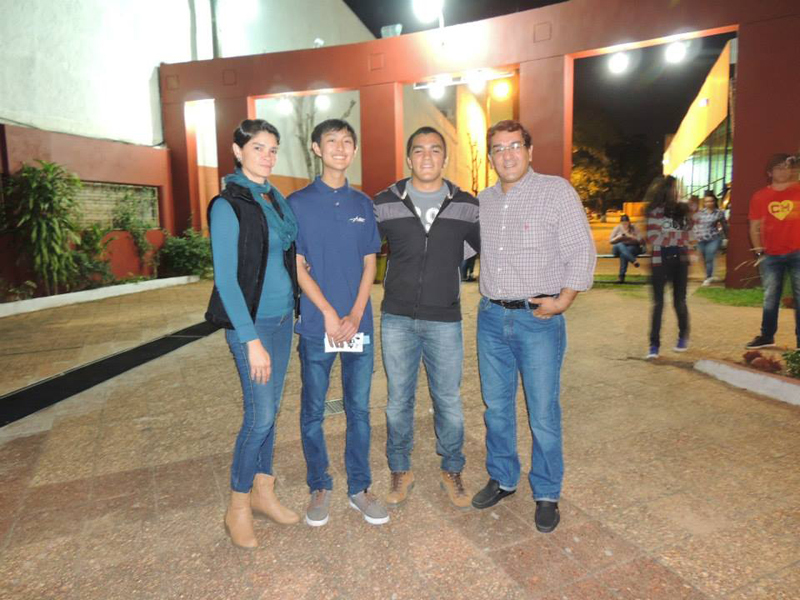 With my host brother I was able to experience the life of Paraguay as a high school student. We went to futbol games, rugby games and even went to movies and parties. My host sister Mayrha actually worked at Fundacion Paraguaya – the partner association at Paraguay – and helped me improve my Spanish. She helped me learn more about the culture and drove me around to every event that I had to be at. I even had a host grandmother that I could barely talk to. I truly wished that I could communicate better because I felt that I did not create enough bonds with my family. I regret the fact that I was not capable to strike a conversation without my host siblings having to translate. Now, more than ever, I am determined to improve my Spanish so that one day I may be able to return to my host family and strengthen our relationships even more. Paraguay is also a very religious country which was great because it related to my own beliefs. Being in Paraguay gave me a chance discover Catholicism on a global scale and how other countries were affected by the religion. It amazed me how dedicated Paraguayans were. People stood outside for more than twelve hours in order to worship and learn wisdom from the Pope (Pope Francis was visiting Paraguay at the time). I also got a chance to meet the Pope but I had to wait eight hours. Those eight hours were honestly very strenuous, mentally and physically, and I was on the verge of throwing up. However, seeing the dedication and endurance of the people of Paraguay motivated me to keep strong. Experiences such as these allowed me to develop solidarity with people from a completely different world. It allowed me to realize that although I was from a different hemisphere, I still shared certain core values and emotions that linked me to these people. You may ask yourself, why Paraguay. Quite honestly, I don’t know myself. Throughout the entire trip, I had trouble with the language, difficulty with food, and at times felt homesick too. I could barely communicate in the very first days, relying on translation from people who were bilingual and could barely start communication. And while in the beginning I was overcome with homesickness and doubts of the impact I could make, over time I began to realize that I had made the right choice this summer vacation. While in Paraguay I was able to experience so much. I went from eating hotel food to eating organic food (made straight from the backyard) from the countryside. Not only that, I was given the chance to shadow my host brother Nico at his school and truly experience what it feels like to be a Paraguayan high school student. Out of all these experiences, the one that stood out to me the most was my trip to the high school Escuela Agricola San Francisco de Asis. The Escuela Agricola is a school where high school students can live and focus on their studies. However, what truly set the school apart was that it was completely self-sustaining through student efforts. They farmed their own food, nurtured animals, did the laundry, cleaned the campus and even maintained a hotel. It was an amazing experience for me because I was able to shadow another student’s life and was able to take care of the pigs, collect eggs from animals, and even milked my own goat. While I was there, it amazed me how much responsibility high school students had and how successful they were in making an impact. The experience made me realize a lot of things. I realized that high school students can make a change. I also realized that life is about struggles and you need to overcome those struggles. 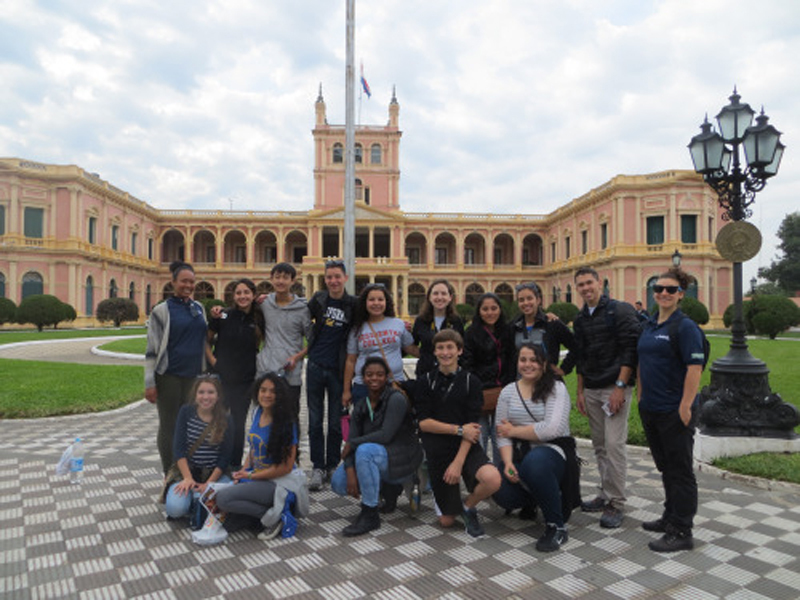 Throughout the trip, I slowly learned the culture, learned the language and eventually fell in love with Paraguay. Although it may not be the wealthiest country, it is still rich because of the people there. In my opinion, Paraguayan people are the nicest, most welcoming people in the world. No matter where I was from, or what I spoke, they all took me in and made me feel welcome. Gracias por la invitación, Paraguay! A shout out to Mrs. Rodriguez for writing me the letter of recommendation. 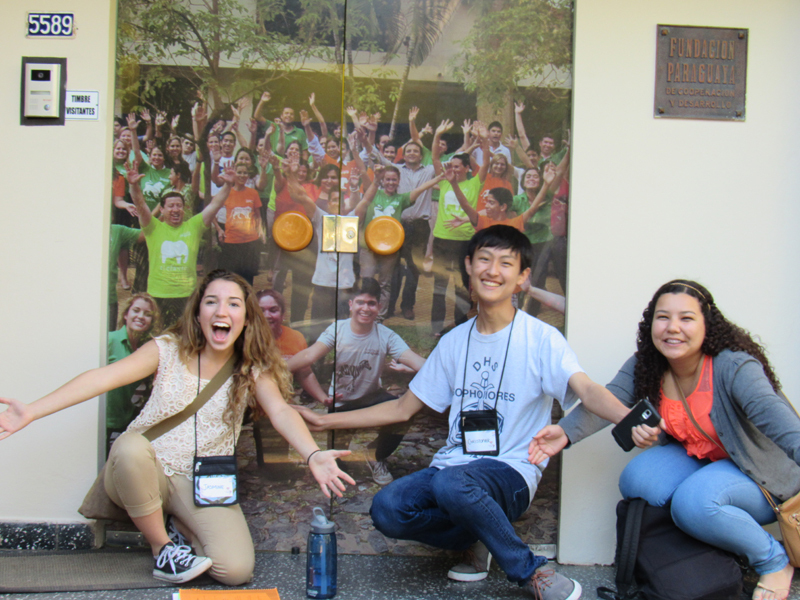 Without it I truly could not experience this wonderful program and I am extremely grateful. Thank you. Love your article, I live in Minnesota a long time ago, and it was an amazing experience. As a Paraguayan and as an former intern I could say that living abroad makes you believe in people kindness.